Are you looking for a standing desk but don’t really want to invest much into it? Believe it or not, you can actually find a quality standing desk for less than $100. As standing desks trend upwards and people are starting to realize just how bad sitting all day can be for you, the great thing is that competition is picking up, and prices are doing down. Now I already have an article about what the most affordable standing desks are, but since then prices have improved quite a bit. It used to be that $200 was a low price and now some of those options can be found for under $100. Do You Really Need a Standing Desk? If you’re looking to spend less than $100 to get a standing desk then there may be a couple reasons for that. Outside of the entire world being massively in debt, you may not think getting a standing desk is a big issue and simply don’t want to spend that much to get one. Look, I get it, standing at work for you may just be an afterthought. You would like a standing desk but don’t necessarily see it as something you have to have. But if you watched the video above I think you can see why it may be a little more important than you originally thought. The great thing is that you don’t have to spend much at all to get a standing desk. Seriously, I’m actually surprised at how low some of these prices are. Anyways here are some options you can go with on this budget. I’m not going to give too many options here because there are a few desks that I think stand out from the rest in this category. You don’t need too many options when the ones I’m giving you here will do the job. I had this desk listed at the top of my list for most affordable standing desks early in 2017 and at that point, this standing desk went for close to $200. At the current time of writing this article, it is going for less than $70 on Amazon! 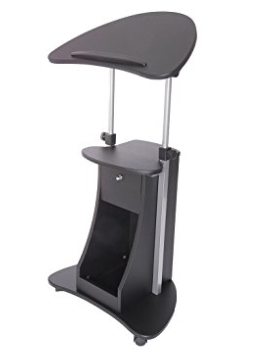 Now, I’ve recently seen this desk range from this price to upwards of $150, so seriously if you can get this standing desk for anything less than $100 then you better snag it while you can. It may not always go for under $100 because of course timing matters. But for the most part, this desk is going to fall right around this price point and be the perfect option for a $100 budget. This is much like the above mentioned, and it’s also made by the same company; Stand Steady. Of course, you’ll have to find it on sale to get it under $100 as the original price is more than double of what it is currently going for. You can tend to find this just under your $100 budget. This desk converter is a little bit simpler than the UpTrak Dual as both levels slide up and down at once. 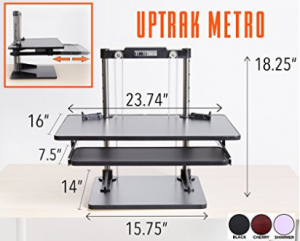 With the easier adjustment, however, it doesn’t have quite as much support as the UpTrak Dual so you’ll want to consider which is more important to you: easy adjustment or more sturdiness. 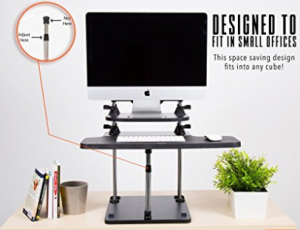 Either way this desk converter can hold up to 25 pounds. Ok, so you want a standing desk, but when you searched for the best standing desks under $100 you really meant: cheapest standing desk possible. Well you’re in luck as this “standing desk” usually goes for $25. 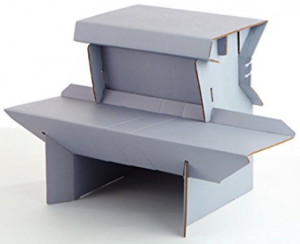 As long as you don’t mind using cardboard as a standing desk then this is the most affordable standing desk you can currently find. And it surprisingly holds 65 pounds! There are also 3 sizes you can go with: small, medium, or large. So just because of the fact that it isn’t adjustable doesn’t necessarily mean that it won’t fit you perfectly. The downside to this option is its long-term durability. Try not to spill any coffee on it and you should be fine for quite a while though. This one is quite different than any other standing desk you can find under $100. It is actually a full standing desk. So you don’t have to add this on top of your desk. It is the desk. Now, usually buying a full sit-stand desk is going to cost you several hundred dollars. The difference with this is that it is only made for laptops. So you can’t use a regular CPU plus a keyboard tray with this option. But if you usually work from a laptop, then who cares right? The base price of the options is less than $100 but right now it doesn’t even go for that much. You may be able to find it for nearly half that. Speaking of standing desks for laptops, this is probably my favorite. It is exactly what anyone living the “laptop lifestyle” would want, especially if you travel a lot. You can just fold this away, literally. 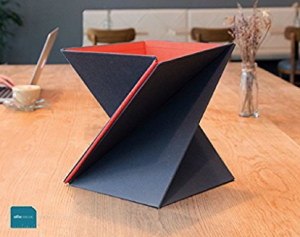 It folds up as small as a paper folder, but then when it extends out is sturdy enough to hold your laptop. It’s slim, lightweight, and even waterproof. Simple but effective. And most importantly, it’s highly affordable as it tends to range from $20 to $40. I’ve laid out a few options that you can work with on this budget point. Sure, there are others out there as well but I think these are the best you can find. Sooo..it turns out it is entirely possible to get a standing desk for less than $100. Be sure to share this article with that co-worker that always complains about their back but never does anything about it. Seriously, there is no excuse anymore.